Have I mentioned that I have fallen in love since I moved to Paris? It’s true. My new love is tender and sweet, with a crunchy flavor of salt that slays me. My love is butter, or buerre, as we like to call it here in France. I know you think you have had butter. You may have even ponied up for the expensive “European-style” butter at the grocery store. But believe me when I say: you have not had butter until you have had French butter. According to my sources, French butter is better because it usually has more butterfat than American butter (duh) and because the cows producing the cream are happy, grass-fed cows who produce yummy cream. And the salt crystals? Oh my. They totally rock my world. 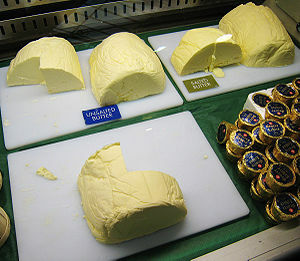 As for the butterfat (because I know you all want to think about butterfat), American butters must contain at least 80% butterfat, while French butters are required to contain at least 82% butterfat (except for the salted butters, which can contain only 80%). That doesn’t sound like a big difference, but as Dorie reminds us, what isn’t fat is water, which can explain a lot. Butterfat = delicious; water= not delicious. Many of the best butters in France contain 84%-86% butterfat. Not the ones that I buy, of course, but I wouldn’t turn down a nice pat of it on my baguette if offered to me. For my everyday, keep- in -the- fridge- and- use- for- baking- and -cooking- butter, I use this one. It’s not expensive, contains 82% butterfat, and is pretty darned good. However, it’s probably not noticeably better than Land O’ Lakes at home, which I always found perfectly acceptable. This one, though, is my true love. These have won my heart. And probably damaged it in the process. But what is love without pain? These little darlings are salted, and contain only 80% butterfat, making them practically a diet food here. They taste like no other butter you have ever eaten. The smaller one is sprinkled with—-wait for it—smoked salt. Yes, that’s right- smoked. And the larger is sprinkled with just plain and delicious sea salt. It crunches seductively when you chew your baguette. And then your eyes roll back in your head and you can do nothing but savor the incredible flavor. A friend told me that her dad, who grew up during the Depression when butter was scarce, used to eat his bread with the butter next to his tongue, rather than on top, so that he could really taste it. I have researched this and it does work. Fortunately, this butter is way too special to sit on the shelf in my little stinky Franprix, featured here. This darling is sold only in specialty stores, many metro stops away from me. Which is such a good thing. We won’t get tired of each other. We’ll keep it special. But don’t think I’m not researching how to get it back to the US in my suitcase! 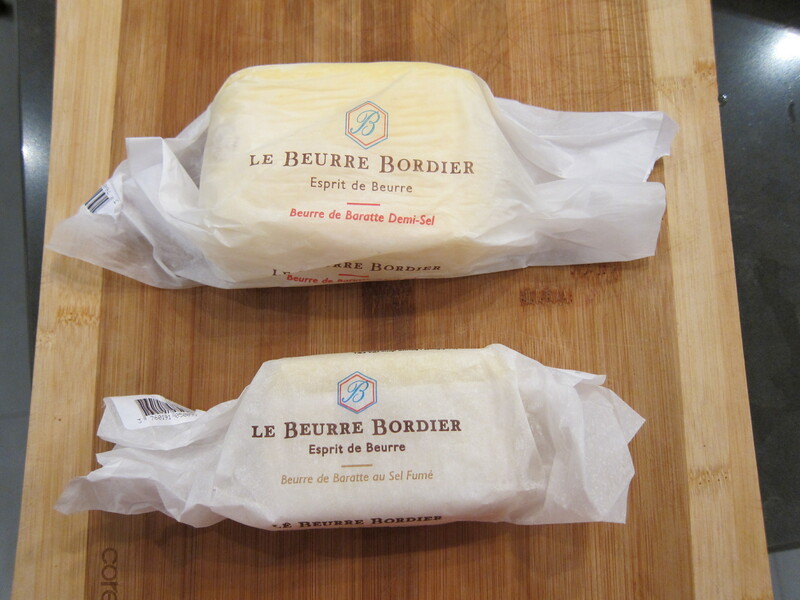 You can read more about Le Beurre Bordier here. If you dare. Please don’t judge me for my new obsession. I have given up Blue Bell Homemade Vanilla Ice Cream, so I figure it’s a wash. Smuggling butter back is surprisingly easy! I’ve done it many times. First, freeze it. Then wrap it in tin foil and cling film and slip into a ziplock. Stuff into suitcase full of clothes and it will slowly defrost during your flight arriving with you in perfect condition. I’ve taken butter all the way to California and it’s been perfect. Merci, Rebecca! I knew it could be done! 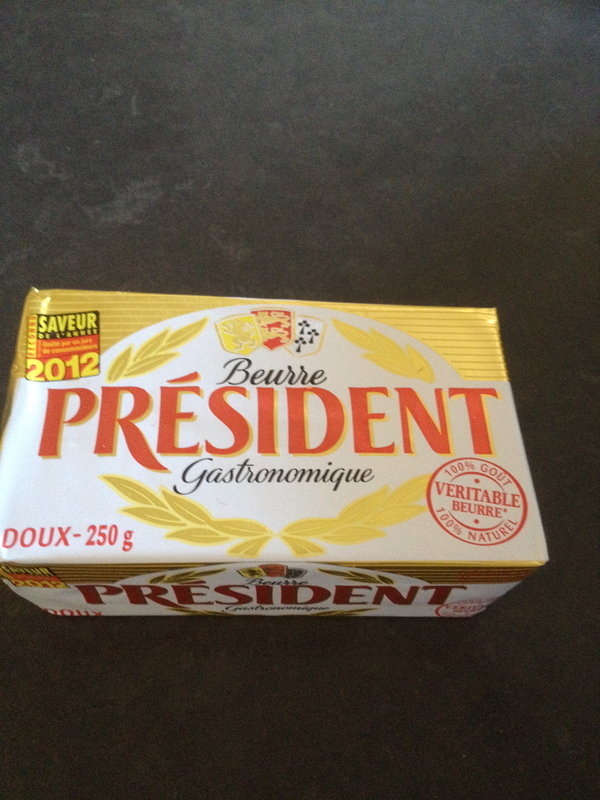 I will be visiting Paris in May/June and if this butter is not available at the local Monoprix or Franprix near my Marais rental apartment, can you tell me where to purchase it? Barbara, I got mine at the wonderful food market at Le Bon Marche, which is called La Grande Epicerie. I’m sure it is available in other places, but La Grande Epicerie is a fabulous outing, anyway. Also, I had a delightful lunch in the Marais last week at Pamela Popo. Enjoy your stay! for my 4th annual trip to Paris this year, so for sure I will not miss including it in my plans. I don’t normally eat a lot of dairy but I cannot resist the cheese and butter in France. Also, thanks for the suggestion of a meal at Pamela Popo, it is very close to where my apartment is located near St. Paul metro, I will definitely check it out. My mouth is watering at the thought of that baguette with the butter. I have given up ice cream and even chocolate for Lent, but the butter stays. Enjoy! Today you made me smile to think of my father’s story being told in a global, world famous blog. In addition to the depression, He also practiced his butter tongue trick while stationed in Europe at the end of WWII. He did not want to waste one bit of what you so enjoyably describe.